The two most common types of geometries used to measure solid colors (colors without metallic or other mica/pearl effect pigments), 45/0 and sphere, are very different instruments and each measure color uniquely. A 45/0 is an example of a specular excluded (abb. SPEX) instrument and the most common type of sphere used in color matching is called specular included (abb. SPIN). The difference has to do with whether or not the specular reflection (or gloss reflection) of the light source is collected during the color measurement and used to calculate the color of the object. Sometimes it is desirable to collect this light, and sometimes not. This does not mean one measures gloss and the other does not. Neither instrument on its own is able to measure gloss as part of the color measurement. In order to actually measure gloss, a separate gloss meter needs to be added into the design of the spectrophotometer making these types of devices true “two in one” instruments. The spectro-guide instruments are able to measure 60 degree gloss at the same time as they measure color. What it means is gloss actually matters for the 45/0 (specular excluded), and does not matter for the sphere (specular included). Let see what this means in the practical sense. Imagine a customer sent a panel, part, or sample for you to match. We will call this the Standard. However, the Standard is flat gloss and the customer wants semi-gloss. A sphere instrument may help you match the Standard, and you may come up with a formula that the sphere instrument says is a good match, however, the match and the Standard don’t visually look the same. Why is this? It’s due to the diffuse illumination in the sphere instrument and the light scattering on the surface on the flat gloss Standard. This is a perfectly acceptable solution if the customer really wanted the same pigmentation package and they are also using a sphere instrument. However, if the customer truly wanted a match that visually looked the same, the 45/0 instrument would have been the better tool. Again, why is this? If you ever get the chance to look inside each of the instruments, you will see a significant difference. The sphere instrument will look bright, white, and highly reflective. When the measurement button is pressed and the illumination of the instrument is triggered, the light will reflect off the surface of the high reflective sphere, and continue to bounce and reflect, until the illumination source turns off after measurement. In a 45/0 instrument, the inside is dark, not reflective, and all light from the illumination source is captured or trapped. 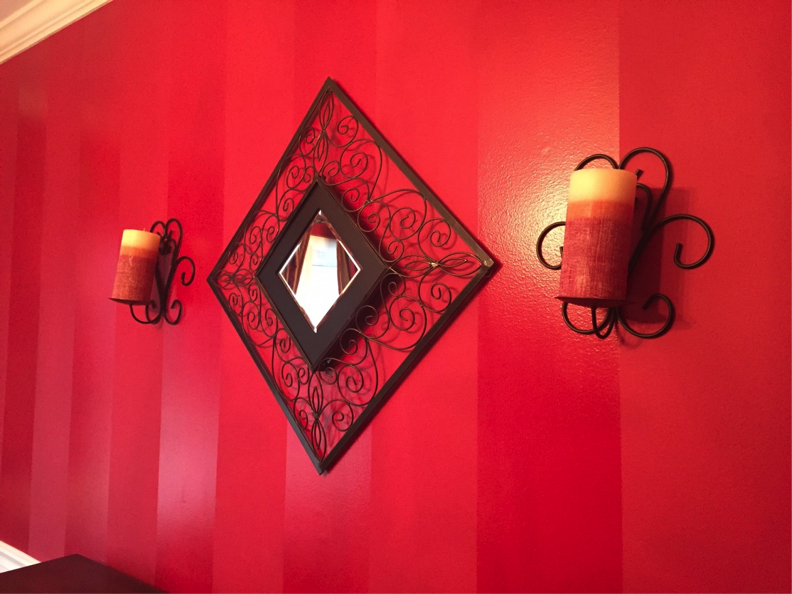 This wall was painted with a flat gloss autumn maple. Then, vertical masking tape was placed to apply a semi-gloss clear creating the striping effect. Question, are the matte and gloss stripes the same color? Photo Courtesy of Jeralyn Camp. Here is another viewing angle. Data was collected for the two sections, matte versus semi-gloss, using both 45/0 and sphere instruments. Each instrument used the matte stripe as Standard and the gloss stripe was measured in comparison. 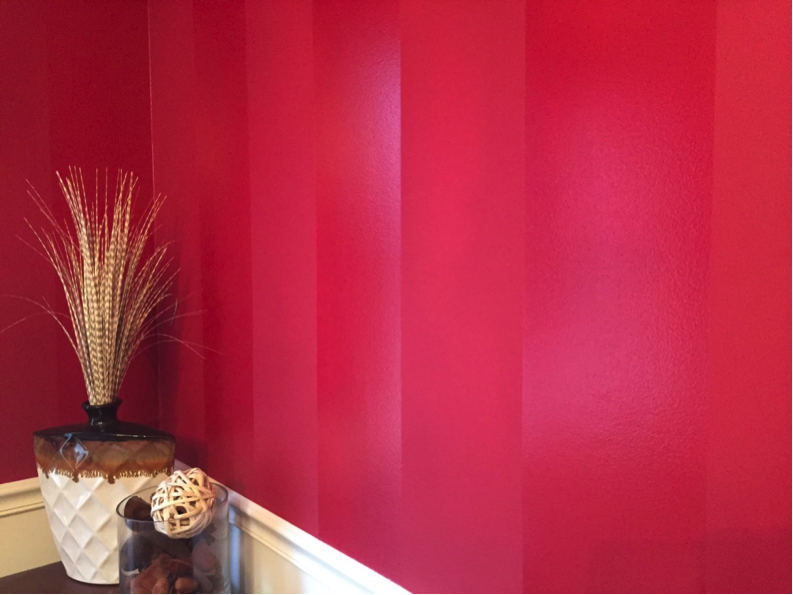 The glossy stripes, and this would be the case for every color, visually appear darker and richer in color versus the matte stripes. This effect creates two different colors. The sphere does not “see” the difference the eye sees. The gloss results are able to show significant difference when the specular included sphere is used. The 45/0 spectrophotometer sees color much in the same way the eye sees, where gloss and texture are contributing factors in our perception of color. So which results are right and which are wrong? Of course it depends on the project goal. If the customer had asked for a visual color match, where the gloss stripe needed to visually look the same as the matte, the 45/0 would have been the best instrument. The question, “Do they match?” depends on the opinion of the viewer or customer. In the case above, the customer would say no, they do not match visually, but that was the intention of the project. Also keep in mind some sphere instruments have a “specular excluded” setting where the goal is to simulate the 45/0 geometry by “trapping” and fully excluding the gloss. However, this trick will only work on high gloss smooth sample matches. In other cases, the “gloss trap” only traps a fraction of the gloss reflection. On very matte or textured samples, the sphere “specular excluded” ends up producing results somewhere between what the eye sees (the 45/0) and the sphere “specular included”. If the customer wants a different gloss result, or needs a textured match, only the 45/0 specular excluded instrument will work due to the light scattering on matte and textured surfaces. The safest solution is to measure using a 45/0 in cases where a visual color match, as the eye sees it, is desired, and to measure using a sphere specular included when a pigmentation color match, or color independent of gloss, is desired.